The Iowa Department of Corrections has a mandate to safely guide offenders back into the community while protecting the public, staff, and other offenders through a variety of techniques and systems. The Department of Corrections is one of the largest state employers - its front line corrections officers supervise basic education, mental health, life skills, remediation, and work experiences while on the job. As the field grows over the next ten years, Iowa will require additional human resources in order to meet this need. Currently, there are 3,001 male and female front line correctional officers employed in Iowa prisons; the Bureau of Labor Statistics forecasts that the number of new positions will increase by approximately 150 roles over the next 10 years. Additionally, the Department of Corrections will be hiring to fill positions due to retirement, attrition, and professional development during this time. 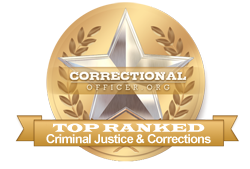 Scroll on for more information regarding a correctional officer job in Iowa. University of Dubuque ranks 1st in our rankings with thirty-six students completing programs in criminal justice out of a total 986 graduates from the 2012-2013 school year. Buena Vista University ranks second in our latest rankings with sixty-two students completing programs in criminal justice out of a total two thousand students in the 2012-2013 school year. Saint Ambrose University ranks 3rd in our latest rankings with fifty-eight students graduating from programs in criminalistics and criminal science and criminal justice out of a total two thousand students in the 2012-2013 school year. Simpson College ranks fourth in our rankings with thirty students graduating from programs in criminal justice out of a total a thousand graduates from the 2012-2013 school year. Iowa Wesleyan College ranks 5th in our latest rankings with 9 students graduating from programs in law enforcement administration out of a total 364 students in the 2012-2013 school year. Southeastern Community College ranks 6th in our latest rankings with 24 students completing programs in criminal justice out of a total a thousand graduates in the 2012-2013 school year. Mount Mercy University ranks seventh in our rankings with twenty-four students completing programs in law enforcement administration out of a total a thousand students in the 2012-2013 school year. Briar Cliff University ranks 8th in our latest rankings with 7 students graduating from programs in law enforcement administration out of a total 518 students in the 2012-2013 school year. Iowa Central Community College ranks ninth in our rankings with twenty-nine students graduating from programs in criminal justice out of a total two thousand graduates in the 2012-2013 school year. William Penn University ranks tenth in our latest rankings with 11 students completing programs in criminal justice out of a total 960 graduates. If candidates scores are acceptable to the department, they may await contact for an interview before being extended an offer of employment. Please note that that the offer is conditional upon successful completion of the new recruit basic training that takes place over a period of weeks at a state correctional facility. The state of Iowa is committed to serve and support correctional facilities in the state by encouraging growth in the field. To this end, the median income for front-line correctional officers throughout the state is higher at $49,100 than the median national income of $39,800. CareerInfoNet.org has published state and national trends at http://www.careerinfonet.org/occ_rep.asp?next=occ_rep&Level=&optstatus=011000000&jobfam=33&id=1&nodeid=2&soccode=333012&menuMode=&stfips=19&x=39&y=13 which predict that growth in Iowa at 5% from now until 2022 is exactly on par with the national growth trend. The predicted job growth translates into approximately 100 jobs annually in the form of newly created openings and existing vacancies over the next decade. The table below lists career information retrieved from the Bureau of Labor Statistics for correctional officers in Iowa. The table is sorted by total employment, with the largest metropolitan areas listed first.